C&R Racing Cooling Additives UNIVERSAL - Dezod Motorsports Inc - Home of the automotive performance enthusiast since 2002. Safe protects gasoline and diesel cooling systems from rust and corrosion. Prevents causes of engine overheating, including lime and scale buildup and coolant foaming. Compatible with all vehicle cooling systems and coolants, both green and orange. Add to your radiator every six months. Advanced formula seeks out and seals internal leaks, preventing antifreeze and water from seeping into the engine. Compatible with all standard and permanent radiator coolants (both green and orange) in cars, trucks, and water-cooled equipment. 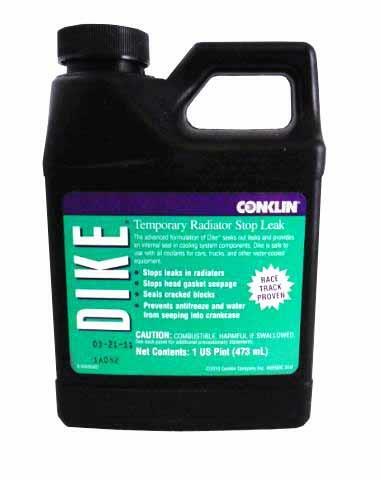 Keep Dike in your vehicle emergency kit for on-the-spot repairs or as a preventative measure for vehicles operating under severe conditions. Add one pint to every four gallons of coolant or water.